At the start of the First World War, Laurier was the leader of the official opposition. Considering the situation and England’s requirements to wage the war, he backed Prime Minister Robert Laird Borden’s war efforts to support England. He even went so far as to become involved in the recruitment of combat volunteers. 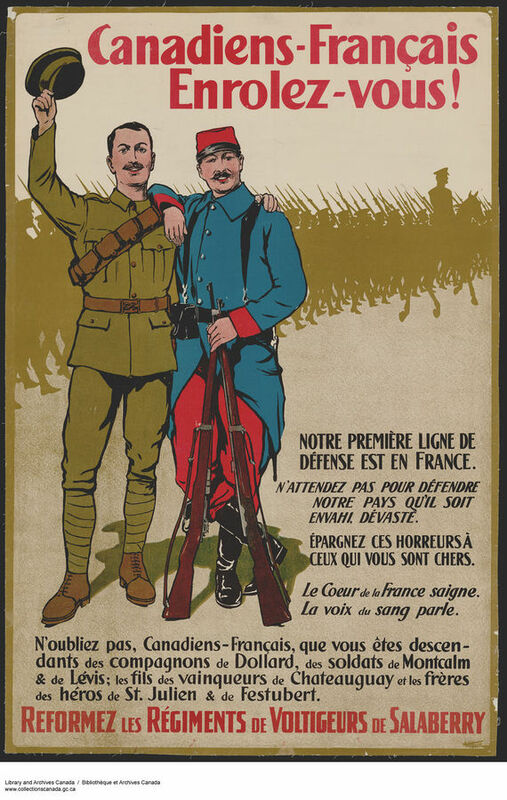 Canada’s involvement in the war would revive the two solitudes: English Canadians felt that the Canadian war effort was insufficient and French Canadians did not wish further involvement and even demanded Canada’s withdrawal from the conflict. The Great War quickly dragged on much longer than anticipated at the onset, and the outcome was far from certain. There was considerable loss of men and equipment. 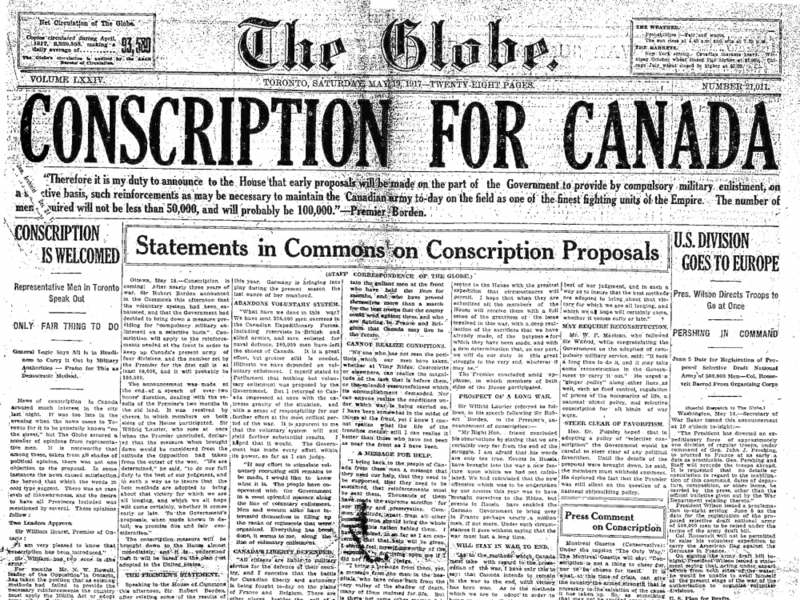 Given that the war effort did not suffice and greater involvement on the part of Canada was necessary, Prime Minister Borden asked Parliament to impose conscription on May 18, 1917. Laurier completely disagreed with this decision, much like the majority of French Canadians. 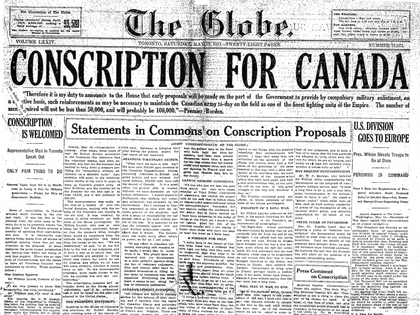 Knowing that many Members of Parliament within his party and Anglophone members from Ontario would vote for conscription, Laurier used every means at his disposal to delay the vote. He believed that by doing this, he would spare the lives of young men sent to the front. Laurier, ever the clever strategist, also viewed the debate as a chance to rebuild an electorate and take power during the next election. 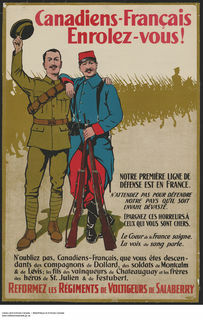 However, the Liberals’ position on conscription was divided and inter-party tensions ran high. Laurier lost his hold over his party and few members supported his position. In mid-August 1917, anticipating an opportunity to remain in power and impose conscription, Prime Minister Borden proposed creating a coalition government. Laurier refused. Some dissident Liberals saw in the proposal a chance to assert themselves against Laurier’s position and agreed to be part of the coalition government, completely disregarding their leader’s decision. This new coalition voted for conscription and the Military Service Act came into force on August 29, 1917. On October 12, 1917, Borden officially headed the new coalition government that included 13 Conservative and nine Liberal Members of Parliament, and one labour representative. At age 76, Laurier emerged weakened and bitter.